The last few days have been anxious times. As Michigan fans, or simply fans of college football, news of Sports Illustrated's bombshell against Ohio State's football program and head coach Jim Tressel couldn't come sooner. When the article finally came out, though, it read more like a rehashing of what everyone already knew, and failed to make the real point that the magazine's investigation hinted at: That since 2002, there has been at least one widespread illegal benefits institution in Columbus that Jim Tressel knew about, in addition to hints of complementary ones that rounded out a lavish life of excess and disregard for NCAA rules by the players and coaches. 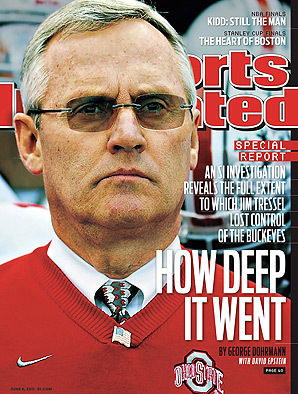 Regardless of the SI article, Tressel was a dead man walking at Ohio State. If it weren't the administration that did him in, the NCAA was likely to hit the coach with a show-cause penalty that would've effectively ended his career at Ohio State--that penalty is a guarantee now. With rumors beginning to swirl that SI was about to drop a bombshell on Tressel and the program, the board of trustees had to act swiftly and, in spite of the terminology the university is slinging about "resignation", fire Tressel. Make no mistake, his firing was inevitable. In the face of the rumors and Tressel's resignation, SI's epic, program-implicating story reads like a whiff of massive proportions. Of the many words in the piece, only a few were of immediate importance to the NCAA. In particular, the article accused up to 28 players of receiving improper benefits since 2002, mostly consisting of the tattoos several of the team's current players are already serving punishment for. There were other allegations (that the players also smoked marijuana bought with traded, NCAA-violation goods), but much of the article was fluff or regurgitated information we already knew or had assumed. There was a big song-and-dance to rehash all of the violations and improprieties of Tressel's career, dragging his name and reputation mercilessly through the mud; a reputation that was, admittedly, built on lies, ignorance, and cheating. But the cars OSU players are driving around campus? Just more hearsay, albeit believable hearsay. Pay for play schemes? Nowhere to be found. Implications of cooperation by the AD or Tressel? Nonexistent. But in that last potential allegation was the meat of the SI article and where they missed their greatest opportunity. Authors George Dohrmann and David Epstein dug around and uncovered a bunch of information that most people had assumed already existed. But they also found connections between boosters, companies, Tressel, and the Ohio State program but never made the bold statement or argument that everyone was looking for: That Tressel knew about, encouraged, and harbored a culture of cheating and recklessly flaunting NCAA rules, including massive improper benefits by big-time program boosters. Instead, they basically assembled an NCAA report on violations with a few reporterly bits added in. But it's not SI's job to report to the NCAA. It's their job to find the facts and report a narrative. Their narrative is missing a climax, even if it's one that is pieced together through abounding circumstantial evidence and common sense. The story's impact should not be disregarded. Despite it amounting to little more than "more players got tattoos", the article points out that, well, "more players got tattoos". This might seem minor in the face of all the other allegations facing the program--and those rumored to be included in the SI article--but there are now 22 new major NCAA infractions that have been levied against the school; violations that most familiar with the program claim a coach would be negligent to ignore. If all or many of them are viable cases against the program, this investigation more or less assures a "Lack of Institutional Control" penalty be added to the school's punishment. Meanwhile, the NCAA is reportedly launching the real investigation, the one that looks at Terrelle Pryor and his plethora of new cars, that, in addition to the ongoing improper car deals that the NCAA is currently investigating. Unfortunately for SI's sake, the shock and awe everyone was anticipating seemed to dissipate with little in the way of new discoveries. But then again, this might not have been the final crescendo, rather a key scene in the decline of the Ohio State football program.